It's pretty simple, really: I've compiled a list of all of the hockey games that I've attended, including my ongoing "quest" to see a game in each of the 31 NHL markets. - Met several of the Colorado players before the game, including Claude Lemieux and (future Blue) Scott Young. - A 4-0 playoff win over a hated rival: still the greatest game I've seen in-person. - 0-0 game in the 3rd, until the Wild score on a penalty shot. Blues pull the goalie, and the Wild score an empty-netter. Blues keep the goalie pulled and add a late goal to lose 2-1. Very bizarre, very boring. - Blues wrap up the series 4-games-to-1, and I get to see my first and only playoff "handshake line". - My favorite all-time member of the Blues, the late Pavol Demitra, scores a hat-trick. - In town to visit my Dad for the holidays, I get to see these two teams face off for the first time after the blockbuster offseason trade that sent Ryan O'Reilly to St. Louis. - A Devils team at the height of their "neutral-zone trap" era against a Blackhawks team that had been eliminated from playoff contention the night before. The result: one of the most boring games I've paid to see, ending in a 1-1 tie (remember those?). During the 2nd intermission, the Jumbotron cut to a shot of Billy Corgan in the crowd, so I spend most of the 3rd period and OT trying to find where he was sitting. 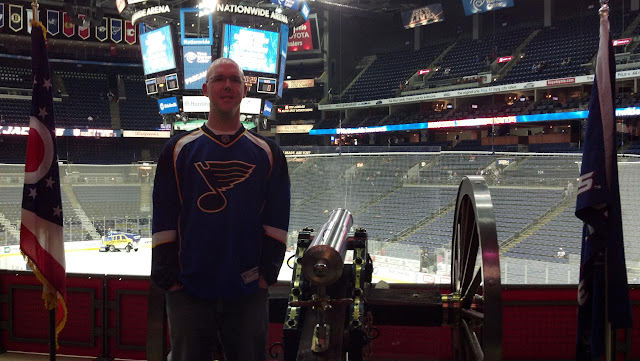 - Tony Amonte scores a hat-trick in a Hawks victory, which made it easier for me to escape from "enemy territory" while wearing my Blues jersey. Added bonus: after this afternoon game, I drove across town to see a Chicago Wolves game later that night. - The Angels were playing the Yankees in the ALCS at the same time, so most of the TV's in the luxury suites were tuned to that game. When the hockey game ended, people crowded around any TV they could find in the concourse to watch the conclusion of the baseball game. - Got to see Teemu Selanne in his final season, and he wound up scoring a goal. 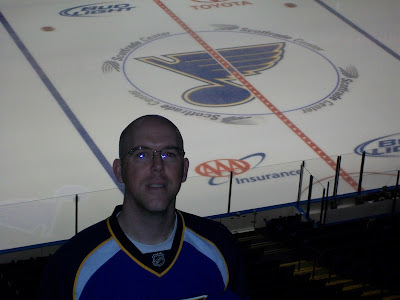 - Game 2 of my "2 NHL Games in 1 Day" adventure. 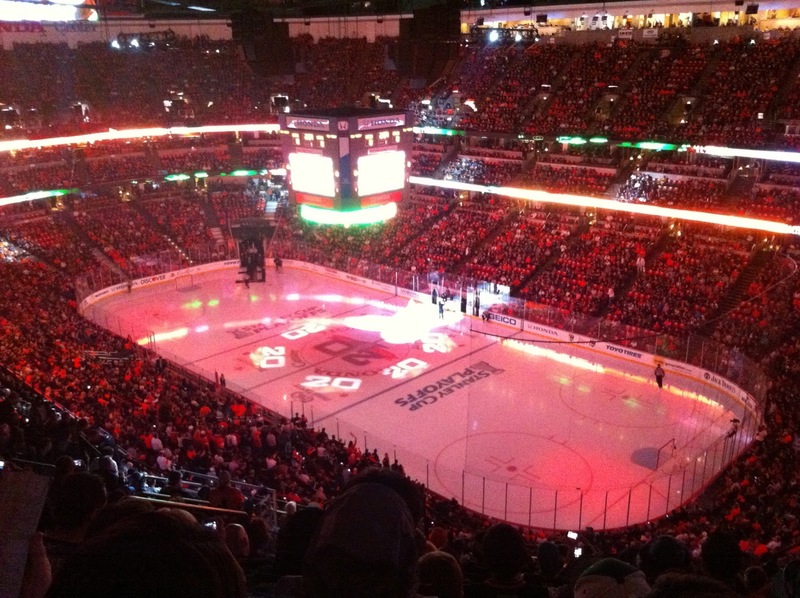 - My first California playoff game was a memorable one, featuring the most energetic crowd I've ever seen at The Pond. A rousing win for the home team was the perfect end result. 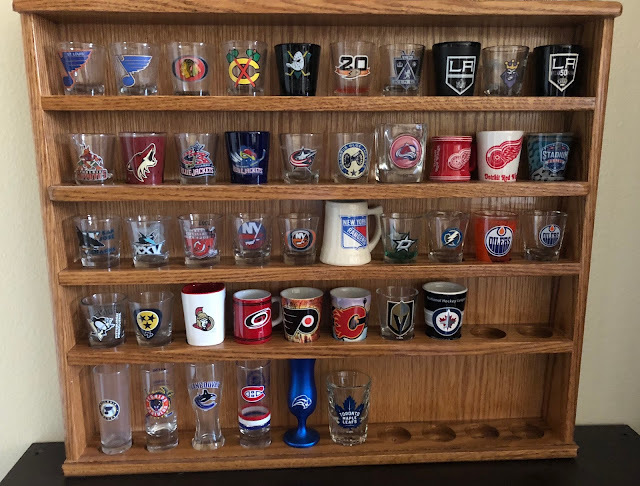 - Another exciting crowd for a Ducks playoff game, which saw the home team victorious in a 3-0 shutout (although, if not for the heroics of Flames goalie Karri Ramo, the final score would have been much more lopsided). - Just before their inaugural season in the NHL, the expansion Golden Knights come to Orange County for a preseason game and skate away with a 4-2 win. - Unemployed, I decide to go to my first game after moving to Los Angeles, as there is a "career fair" being held outside before the game (of course, no real job leads resulted). Luc Robitaille was also honored in a pre-game ceremony - for what, I cannot recall. - Alex Ovechkin's rookie season, and I can vividly remember him skating circles around the Los Angeles defenders. - Evgeni Malkin's second goal of the game was the OT winner. - Yes, the infamous "clock malfunction game"! - Brian Elliott and Jonathan Quick stand on their heads, as neither netminder allows a goal in regulation or OT, and the Kings win in the shootout. - My first home opener. - Jay Wells "bobble fist" Legends Night. - My first Blues-Kings game at Staples Center since the bitter back-to-back playoff defeats in 2012 and 2013. Unfortunately for myself and the other Blues fans in attendance, the Blues lost once again. - Game 1 of my "2 NHL Games in 1 Day" adventure. - A ho-hum 5-2 victory for the Kings, but notable for the fact that Panthers forward (and southern California native) Rocco Grimaldi was playing for the first time in his home state after having played in an AHL game that morning! - Another Blues-Kings game at Staples Center, another unhappy trip home. This time was even worse, as St. Louis blew a 3-0 lead and lost 6-4. But I did get to see Martin Brodeur in net one more time, two weeks before his final NHL game. - I had to see Connor McDavid during his rookie season, and he was just as impressive as I had hoped. - Fifteen years after its first hosting duties, the Staples Center was once again the setting for the mid-season exhibition. The league's centennial season also saw the recognition of the NHL's 100 Greatest Players, many of whom were in attendance to be honored. - It was Jarome Iginla's first game in a Kings uniform, and my first chance to see rookie phenom Auston Matthews. - Less than 24 hours after returning from Alberta, I see McDavid and his Oiler teammates once again. - There's that man again - my fourth time seeing Connor McDavid face the Kings. - My wife and I are seated just behind the visiting bench, giving me an up-close look at Mark Scheifele, one of my new favorite players. - Wild game, with Ilya Kovalchuk tying the game in the final minute after the Thrashers pulled their goalie. No scoring in OT resulted in an 8-round shootout, with the Coyotes ultimately prevailing on a goal by Daniel Carcillo!?! - Wild game, in that it was a game against the Wild (otherwise, it was a pretty boring 4-1 win for the visitors from Minnesota). Making matters worse, since the game was played during the height of the Coyotes ownership debacle / relocation rumors, an announced crowd of less than 11,000 people showed up on a Saturday night to see a Wild team that had the best record in the NHL at the time. - Another trip to the Valley of the Sun, which found our group sitting a mere FOUR rows from the glass: the closest I've ever been seated for a game. - Connor McDavid scores before we even get to our seats, but the Coyotes come back to win in the shootout. - Part 1 of my road trip into "Big Ten Country": amidst a passionate crowd of visiting Flyers fans, I get to see a very exciting win for the home team. - The finale of the Rust Belt Roundabout, and another opportunity to see a game at what is quickly becoming one of my favorite venues. How can you NOT love the Goal Cannon?! - Not the most exciting game, as the Avs lost 4-1 to the visiting Panthers, but it was a memorable road trip into a very pleasant city. - At the exact same time that hockey fans in southern California were enjoying the outdoor game between the Kings and Ducks, I was up the coast experiencing the great atmosphere inside "The Shark Tank". - I finally get to experience an outdoor hockey game, as the Stadium Series returns to California for the second consecutive season. - After seeing an AHL game during the afternoon, I return to SAP Center for an evening contest during the Sharks' 25th Anniversary Season. - Part 1 of the "Big Apple Trifecta": a raucous crowd of rival fans made for an incredible setting, as two 1990 draftees stole the show. - Part 3 of the "Big Apple Trifecta": an overtime thriller from "The World's Most Famous Arena". - The final stop of my Great Southern Sports Adventure, in which Vladimir Tarasenko completed his hat-trick with an OT winner. - A paltry home crowd. A humid winter night. First NHL game of my Sunshine State Safari. - The Sunshine State Safari concludes with a memorable game on Thanksgiving Eve, as Martin St. Louis makes his first trip back to Tampa in a visiting uniform. - Forty-eight hours after seeing Madonna in concert, my Vancouver trip continues with a return to Rogers Arena to see their "anchor tenant". - The first NHL game of my Rust Belt Roundabout is also my first time to see 3-on-3 overtime. - A quick trip to the South wraps up with a raucous game on a frigid night. - The Empire State Excursion extends across the border for a classic rivalry on Hockey Night in Canada. - A second all-Canadian matchup in as many days, as the Empire State Excursion rolls along. - The Empire State Excursion comes to an exhausting end, with a Saturday matinee affair on the banks of Lake Erie. - I took a journey down Tobacco Road, and experienced a very hospitable crowd (and AMAZING food!). - At the conclusion of my Philly trip, I make a quick visit to New York City for a wonderful Sunday: a matinee show on Broadway, followed by a visit to the new home of the Islanders. - The first game of my "Alberta Engagement" gives me a chance to introduce my new fiancee to the magic of Hockey Night in Canada! - Game 2 of the "Alberta Engagement" sees us follow the Ducks down Highway 2, and includes an encounter with one of the NHL's best mascots. - I am on hand for history as the league's newest team takes the ice for their first regular season home game: a somber affair that served as a tribute to those affected by a devastating tragedy. - "Black Friday" in Sin City features a matinee battle between divisional rivals, as well as Nate Schmidt's first home game following a lengthy suspension to begin the season. - My frigid visit to Winnipeg is highlighted with a Hockey Night in Canada contest, which required overtime to determine a winner. - In the midst of my massive "Michigan-za! ", we spend an evening in downtown Detroit to see the new home of the fabled Red Wings. - Saturday Night at the "center of the hockey universe" does not disappoint, as we are witness to a thrilling Hockey Night in Canada affair between the two best Canadian teams of the season. - Our visit to the "State of Hockey" includes a stop in Minnesota's capital city, and a low-scoring defensive struggle. - The nation's capital is the setting for a brief vacation in wintry conditions, and our chance to see the defending Stanley Cup champions in action. - My first NHL game, at the age of 17. During the pre-game skate, I walked down near the glass to see the players come out on the ice. Even though he was a bit shorter than me, I could not get over how imposing Al Iafrate was on his skates. - Wayne Gretzky broke Gordie Howe's all-time goal-scoring record two weeks before this game, so Peter Stastny and Brett Hull gave The Great One a plaque at center ice before the game. 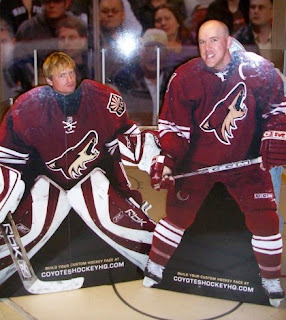 - One night after seeing the Coyotes in Glendale, I go to downtown Phoenix to see their old home. As an added bonus, I get to see three future Hall of Famers suit up for the Suns: Grant Hill, Steve Nash and Shaquille O'Neal. - Once the team moved to the Staples Center, this longtime home of the Kings was turned into a church at one point, before being sold to the Madison Square Garden Company and converted into a full-time music venue. Some of my favorite concerts of all time have taken place at the Forum: Green Day performing for nearly three hours on their 21st Century Breakdown Tour; Lady Gaga closing out the North American leg of her Joanne World Tour; the dynamic Dixie Chicks on their DCX MMXVI World Tour; the final concert (as of now) from Rush; and, most memorably, seeing Prince THREE times during his 21-night stand in 2011. - Part 2 of my road trip into "Big Ten Country": a 3-0 win by the Islanders made for a very listless crowd. - Part 2 of the "Big Apple Trifecta": a sparsely-attended matinee at the venerable arena, featuring a second 2-0 shutout in as many days. - The WHL playoffs were underway on the day I arrived in Edmonton for my Alberta trip, so I got to see my first Canadian junior hockey game. - The Battle of Alberta serves as the backdrop for my first Hockey Night in Canada game: a fun contest that concluded a pleasant trip to the western province. - Just before the legendary arena closed its doors after a storied 65-year existence, I got to spend a wonderful weekend watching the championship tournament of the Canadian Hockey League. - The day after seeing the Canucks in their new arena, I visit the team's previous home for a WHL matchup. - I make the long drive from Buffalo to Ottawa, arriving just in time to take in an OHL Friday Night game at the original home of the Senators. - On my final day in the city, I peruse the historic surroundings of one of the most famous arenas in hockey history. It now serves as a shopping center. - Like the Montreal Forum, the hallowed halls of this legendary site now houses a shopping complex and grocery store, as well as the home rink for a local college team. I was fortunate enough to spend one morning in the building during my "Ontario Odyssey". - Nearing the conclusion of their final season in Oakland, I get to see the two-time defending NBA champions host Dwyane Wade and the Heat, during his final season in the league. It was a very exciting game in a cool building, but I was disappointed to see that there was NOTHING inside to pay tribute to the history of the Seals and their brief time in the NHL. - A sold-out contest serves as my first AHL game, which is also the first for the newest iteration of the Gulls' franchise. - The Condors and Reign take their rivalry from the ECHL to the AHL, as the league successfully expands to California. - The Reign make the transition to the AHL, and I get to meet team GM (and Hockey Hall of Famer) Rob Blake! - The southern California rivalry extends into the Calder Cup Playoffs, with a very spirited contest from the Pacific Division Final. - There was no one there (hardly), but it was fun to see the first of two professional games from the same arena on the same day. - Of course I spent Valentine's Day watching the sport I love. *TEAM RELOCATED TO BINGHAMTON, NEW YORK AFTER THE 2016-17 SEASON. - A sellout crowd packs the tiny Auditorium for a Wednesday night intrastate clash - minor league hockey at its finest! - I get to see an IceCaps team featuring John Scott in one of his last professional hockey games, two months after he captivated the hockey world at the NHL All-Star Game. - My first hockey game with my wife! I also got the chance to meet a few prominent NHL figures: former goalie Sean Burke, former Jets coach Claude Noel, and former Coyotes GM Don Maloney. - In between visits to Philadelphia and New York City, I took a detour to eastern Pennsylvania to see the popular AHL franchise in the "Chocolate Capital of the World". - As the fabled venue approaches its 100th anniversary, we wander the premises and take in some AHL action during my "Ontario Odyssey". - The NHL lockout was underway, so I ventured out into the Inland Empire to see the only professional hockey team in southern California - and the Stanley Cup was on display since the Kings were the reigning champ! - The Ides of March also happens to be "Star Wars Day" for this matinee affair. *TEAM RELOCATED TO MANCHESTER, NEW HAMPSHIRE AFTER THE 2014-15 SEASON. - The "Michigan-za!" comes to a close with a sold-out contest in front of some of the ECHL's most devoted fans. - My second WHL playoff game in as many days brings me south to Red Deer for a hard-fought matchup between two Alberta teams. - During my trip to Winnipeg, I made the 2-hour drive west through the snowy prairie to see the passionate hockey fans in the charming town of Brandon. - Following an afternoon at Niagara Falls, I cross the border into Canada for an action-packed OHL playoff game from a beautiful arena. - The "Michigan-za!" kicks off with a visit to Saginaw, where we scored free tickets! - The same two teams face off for the second time in four days, as the "Michigan-za!" rolls into Canada. - The "Michigan-za!" makes one more stop in Canada, with the defending Memorial Cup champions serving as host for the evening. - The first OHL playoff game of my "Ontario Odyssey" is a wild overtime game in a fun and intimate venue. - The "Ontario Odyssey" rolls along as the two teams square off for the second time in three nights. Meanwhile, my wife and I are named the "Couple of the Game"! - After starting the day at the Blue Jays home opener, we venture across the city to see an exciting overtime contest. - The sixth and final OHL game of the "Ontario Odyssey" features a dominant Bulldogs team that would go on to win the OHL Championship. - My first NCAA experience is on "Senior Night" in East Lansing, as the "Michigan-za!" kicks into full swing. - After watching the Michigan basketball team in the afternoon, we walk across campus to the legendary venue and see their hockey brethren face off against the top-ranked Fighting Irish. - Kalamazoo is the setting for the final college game of the "Michigan-za! ", and a visit from the UMD squad that would eventually win the Frozen Four that same season.